On my way to work the other morning I got an idea in my head for a new knitted plushie pattern I wanted to create. I wanted to name him Huug, and he would be the Hug Monster... so Huug the Hug Monster©! I made a few sketches and started guesstimating stitch counts and then went home and began testing. My final result turned out pretty much how I wanted it; the face is something I want to work more on. The original idea was that Huug has two small beady little eyes and two fairly big buck front teeth sticking out. I'm not so good with embroidery on knitting, so I hope that my future versions of Huug's face turn out a little better with some tweaking. Anyway, he was originally released here as a fairly popular free pattern, however due to a retail venture I've decided to remove it. 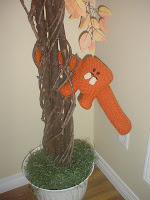 Sorry :( Huug the character and his knit/crochet pattern was officially and legally copyrighted recently for said venture. I will share more Huugs I make in the future and more backstory about this wonderful creature in the future instead. Huug the Hug Monster© can / will come in many different colours -- I just used orange because this Huug is for my fiance, Lucas. I envision Huugs of every colour of the rainbow and even made from fuzzy and furry yarns to make hairier cousins. luv this pattern i have one on the needles right now! Mine's green. Lime green roolz! 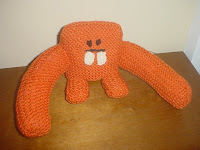 I'm blogging about my Hugg Monster in progress at http://www.sophiadembling.com/2008/07/when-cute-crafts-go-bad.html. Thanks for a cute pattern to play with! I can just about make scarves, coasters and place mats...anything rectangular and have been wanting to make christmas gifts this year but not a bloomin scarf again. I dunno about "genius" (or even "geennniiuss" lol) but I'm so glad you like it! Simple and easy is what I was going for -- I'm fairly new to knitting so this was my next step (keeping it rectangular because that's what I know how to do best!) from scarves.